A New Grading System: The last one you’ll ever need (once you’re ready) | Magister P.
This grading system is the result of my experience combining common weighted grading categories (e.g. Homework, Unit Tests, Quizzes, etc.) with Standards Based Grading (SBG), and a Classroom Management (adaptation of Robert Patrick’s D.E.A.). Despite overall positive outcomes, the combination had its drawbacks. Besides, the longer I teach, 1) the less explicit instruction I give, and 2) the more streamlined/simple my practices become. From what I’ve learned from veteran teachers, this is a normal progression for a teacher, but I seem to have skipped about 10 years of trial and error. This new grading system is extremely easy to use as a teacher and extremely clear to understand as a student. There are only two; Proficiency (90% according to THIS scheme), and DEA (10% according to THIS scheme). See this post for more variations of grading weights. Proficiency is a Standard of attaining levels of communication according to ACTFL’s Proficiency Guidelines. DEA is comprised of habits and routines that make language acquisition possible in the classroom. For Proficiency, I began using Martina Bex’s Proficiency Targets, since she did an incredible job of distilling all that ACTFL info into measurable features of each level. My adaptation focuses on just two proficiency levels per course, and anticipates that a few students will exceed the course goal and reach a third proficiency level. Here’s a screenshot of Novice Mid. Note that meeting the goal is a grade of 85, and a perfect DEA score of 100 adds 10 points to the overall grade. Thus, it’s very reasonable to earn a 95 (A) for meeting the goal; exceeding the goal earns the overall grade of 100 (A+). – Here are all of my Proficiency Goals. – DEA is pretty straight forward; you can read about what works in my classroom here. Set a realistic Proficiency goal for each course (e.g. Novice Mid for Latin I, Novice High for Latin II and III, and Intermediate Low for Latin IV, etc.). Note that ACTFL (chart on p. 13) expects students beginning a language in high school to remain at the Novice level for about two years. 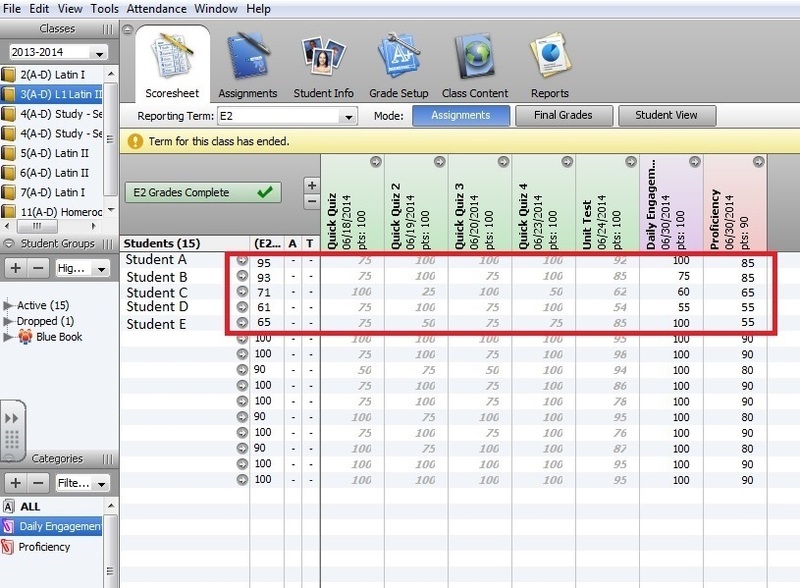 You can use a number of assessments (even just class observations) to arrive at a proficiency level, and update each student’s Proficiency grade throughout the quarter. 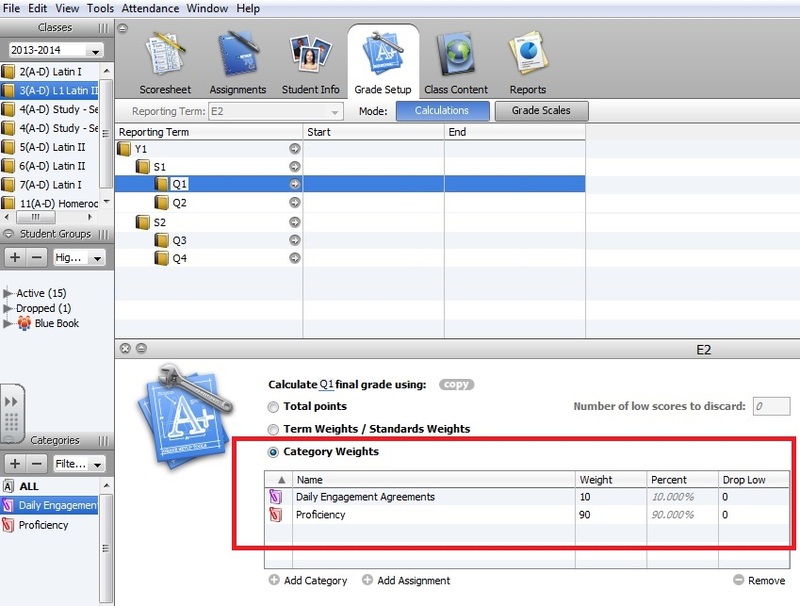 When you create the Proficiency assignment in the gradebook, be sure that the highest grade possible is 90, not 100. For DEA, create the assignment and start each student with a 100, and enter violations daily. My students can earn 5 DEA points back by coming in for a 5min conversation in Latin. They can also reassess their Proficiency grade if they think and/or can prove they are at a higher level. Most don’t bother to reassess, but students, parents, and admin love the concept of reassessment. It’s a safety net. The best way to use this grading system would be to manually change the final end-of-year grade to reflect the student’s current Proficiency level. You must check school policies before doing so. I would even be prepared to make a case about how in a proficiency system since students might take the entire year to show mastery, so we should not be penalizing them for lower grades earlier in the year. Also, have your school’s mission statement handy…there’s likely nothing about grades in there, which should give you some leverage. It all makes perfect sense, but a lot of what goes on in schools doesn’t make sense. Still, this is a more forgiving grading system than most even if you must average grades from each quarter (like every school I know of). Having only two grades in the gradebook once per quarter is unacceptable in most secondary schools. You need to report more scores. So go ahead, give some quick quizzes (e.g. 4 true/false questions about the day’s class, etc. ), or even a 100 point Unit Test. Then, create a third Portfolio grading category, and enter the scores so kids and parents can get a sense of “accuracy” and “consistency” (stop, however, and recognize that language students aren’t expected to BEGIN to be accurate/consistent until the third year – Intermediate level). These reported scores won’t be calculated into the quarter grade since you haven’t assigned the category a weight (see below). You can even exempt the scores if you like. In fact, even if you don’t use this new grading system, remember that you can report scores on a number of assessments, but exempt most of them and only use a few to calculate the grade. Student A meets Novice Mid proficiency, which I’ve set as a realistic goal for Latin I. This student is very active in class with no DEA violations. Sure, she got 3/4 on the first Quick Quiz, and had a 92 on a Unit Test, but we’re not really concerned with any single assessment on one day affecting proficiency. Meeting the goal of Novice Mid is a grade of 85, the perfect DEA score adds 10, which means her overall grade in the class right now is 95. This student meets Novice Mid, but is less consistent as seen by the reported scores, and hasn’t come in for any conversations in Latin to make up the lost DEA points. You should know that “being prepared” is part of DEA under which completed homework could fall. Student B rarely does homework, but still has a decent proficiency. Meeting the goal is a grade of 85, and DEA is 75 (=+7.5), which means his overall grade in the class right now is 92.5, rounded up to 93. If Homework was a separate category (~15% of the overall grade like most schools), Student B would be bombing that category. His proficiency is right on target which means he actually doesn’t have to be doing that homework. We all know a student whose grade/GPA is negatively affected by refusing to do assigned work. Although this begs an inquiry into the nature of assigned work, remember that if you must give homework, absorbing it in the DEA grading category helps, never hurts, all students. This student is a true Novice Low. Since the goal for Latin I is Novice Mid, Student C has a Proficiency of 65. Her grades on the reported scores are inconsistent, and she has trouble engaging in language acquisition (perhaps constantly speaking in English to those nearby). Her overall grade in the class right now is a 71 (65 + 6 DEA). Student D is unable to show Novice Low proficiency all the time, which means he has a 55 (the goal is Novice Mid). His ability to engage in language acquisition is even lower than Student C, and has a DEA grade of 55 (=5.5). Although daily quick quizzes were OK, a low Unit Test grade shows that this student has some trouble retaining over time. Note how low test scores from more students would otherwise indicate that YOU, the expert, did not deliver enough repetitions of the tested language in NEW contexts. Student D’s overall grade in the class right now is a 61 (55 + 6 DEA). This is a rare scenario, but might occur. The only difference between this student and Student D is that Student F is putting quite a bit of effort into acquiring Latin. His DEA grade is a perfect score, just like Student A who has an overall grade of 95, but since this Student F inconsistently shows signs of Novice Low proficiency (below the goal), his grade is a 55. Overall, he has a 65 in the class right now. The reason this is rare, is because the Daily Engagement Agreements allow for optimal conditions in which to acquire language in the classroom. Repeat, in the classroom. That is, very few students have a high DEA grade and low Proficiency. It’s possible that Student F is going through some stuff at home or at school. Call home, and talk to this kid. He also might need accommodations. A simple solution is to lower the course goal for him from Novice Mid to Novice Low. He is still getting a Latin experience, and you are certainly not teaching with a one-size-fits-all approach…there is nothing wrong with any of that. – Use Proficiency Goals, and DEA. – Assign a Proficiency Goal per course. – Create a DEA and Proficiency assignment (remember, Proficiency’s highest grade possible is 90, not 100) with due date as end of marking term. – Update DEA and Proficiency grades with any changes. – Create and report additional as needed (Portfolio category worth 0% of grade). – Spend your time practicing CI Strategies, understanding what interests your students, delivering compelling spoken and written messages, and not grading countless assessments. – Update 8.10.16 Many different variations have been collected over time. Find one that suits your needs, or contact me so we can brainstorm and I can add one to the list. Thanks so much for sharing this. I definitely plan to adapt this to my course. I am a little confused about how you calculate the DEA. Does each student begin with 100 DEA pts each day, or with 100 DEA pts each grading term? I can imagine some students exhausting the 100 pts and going into negative DEA pts if they only have 100 per term. No, once per quarter, which sends the message that it’s important. Remember, they can make up missed points. If you have students violating these every day, it’s time to call home, and/or get admin involved. Thanks for this! Very useful. The only issue I see here is that your rubric for Novice Low/Mid/High focuses on output and a little bit on listening comprehension. To me, that seems like only half (or less) of the picture. If our goal is for students to be able to read authentic texts*, then surely there must be a reasonable way to assess reading ability at the same time. Do you have any further ideas on how that is/can be incorporated into this system? * which may not be YOUR goal, in which case never mind. The most important part of this system is the structure. Feel free to adapt each level to focus on whichever starred feature you value (e.g. function, context, accuracy, strategies, vocabulary, etc.). My classes naturally focus more on understanding (i.e. listening/reading comprehension), but there are other helpful “signposts” for each Proficiency level. The Output you mentioned is a very obvious and immediate measure of Proficiency. We don’t need to spend countless hours determining a student’s grade. I would say that Timed Writes offer most of the evidence you’ll need, regardless of whichever starred language features you choose to use. Keep in mind that all this “stuff” is necessary for teaching in schools, but shouldn’t drive what we do. We could probably rip apart the features of each Proficiency level and cross-reference them with ACTFL’s Proficiency Guidelines, Performance Descriptors, LinguaFolio, the I Cans, but for what? Let’s spend more time delivering understandable messages, and the ability to read Latin, however we classify it, will improve. I was just thinking about your post again, and can say that genuine language production (non-forced output) is evidence of acquisition. This language production is a RESULT of hours of listening and reading, and not the CAUSE of practicing speaking and writing. Although the rubric focuses on language production as evidence, as you observed, most of our time is still spent listening and reading. That is one huge reason that Fluency Writes are timed (~5min of class every week or so is all we need to devote to writing for the first few years), or that Story Retells are limited to a few minutes. Perhaps a more succinct comment is that the language production (output) features you see are realistic expectations of a CI class focused on listening and reading. Pingback: Complete Standards Based Grading (SBG) Systems: Why not in a language course? | Magister P.
I love it. This is a great resource. I’m going to think about it some and come back with some questions…unless it all still makes perfect sense! I’m glad Ben posted this on his blog. It seems like a very good way to meet administrators requirements for the SBG diploma which for CI classes makes no sense and is a waste of time. Is it the average of the formative assessments (quick quizzes and such) or are you setting aside time to give summative assessments (which are generally project based). Personally I HATE speaking assessments. I have never done them for a grade, only for make up absences. It seems to me that determining the level of proficiency the way ACTFL scales them implies memorization which we don’t want and when they attempt “free production” they sound horrible! – Arriving at the Proficiency grade is simple: use any evidence that could satisfy the hallmarks (e.g. comp Q’s, class conversations, Timed writes, retells, etc.). If a student understands you and what they read, they’re meeting the target. – The formative assessments hold 0 weight, are there to inform the teacher what the students don’t know, and are for record keeping only (look at the scenarios at the bottom). However, if a student constantly understands you in class and their quick quizzes confirm that, why not use that as evidence? The point is that kids will prove their understanding in different ways and at different times. This grading system is sympathetic to the language learner. – Not all Output (see my comment to Ellie earlier this month)…look at the last hallmark “You can understand some simple questions and statements, and you frequently need to hear/read things again.” I spend most of my time assessing comprehension. The other Output hallmarks just mean that you COULD use a speaking assessment as evidence, but don’t have to. That’s the beauty of this grading system…it’s so global. Why is the DEA only at 10%? Is that enough to foster TL only and no English? DEA is primarily about management in a CI classroom; there are specific things kids need to do in order to acquire the language we say and they read, and it’s not really like other classes in school. DEA sets up optimal conditions for acquiring language in the classroom. It appears that my 10% is low, and an extreme system would be to grade solely on DEA, at 100% of the grade, since it’s rare (if at all) that students fail to acquire under those conditions. You could try it, but I don’t think that kind of system would fly in most schools. In this more realistic system, DEA sits nicely at 10% since Proficiency is divided into uncomfortable cut-offs (e.g. 90, 85, 75, 65, 55). The 10% from DEA allows for the rest of the grade to be filled in (check out those scenarios at the bottom), which is why meeting the goal is a grade of 85, since it is likely that students earn a full 10% for DEA, resulting in that sought-after 95 (A), but also allowing the really motivated and attentive to earn a perfect 100 (A+). The most jarring experience my students had when I first began teaching was to move them to a 4.0 grading scale. They were enraged to be pushed into those 10 point categories. This system solves that. Thank you very much Lance for your response and time. a. It seems that with this rubric you are targeting/meeting all three Interpersonal Communication Standards in one. Have you been questioned about not assessing each standard under its’ own rubric? Could this compounded rubric fly through the “standards police”? b. If you only give a DEA grade once per quarter but keep score on your hard copy roster, how do students know where they are at in this portion of the grade before the end of a quarter? I thought I could give this grade once every two-three weeks, but I can still see kids coming in to know what their grade is in our highly grade oriented community. One good thing about the way you’ve solved grading is that formative assessments can’t skew a grade in favor of the fast processors so much. I still struggle with: blurts, clowns, disrupts but is a fast processor=high grade vs makes strong effort, never disrupts, positive energy but is a slow processor=low grade. I always accommodate for the latter bc to me CI classes are all about effort and good will. The rest is bs we have to deal with. My ideal (which will never happen in my life time) would be to have pass-fail classes and use my time for improving my teaching skills. Finito. A) All-in-One…nice! I’ll gladly head down to the station to talk with any Standards police. No one is forcing you to assess separate modes of communication…ACTFL has provided those as an organized way to look at language processes. To me, it’s just more work, and a simple way to compound language learning for students. ACTFL’s claim that students aren’t at the same level across all modes is intuitive…just don’t focus on the modes that take longer to achieve (over time), and don’t penalize a student whose strength is in one of three modes. This grading system is about inclusion. B) Put DEA in the gradebook on day 1 as 100, set its due date as the end of the quarter, and subtract any daily violations. Thank you very much. Now I think I got it and will use this. Really helpful for me! I love this grading approach. My school district is all about standards-based grading, and for the past 4 years I’ve been wrapping my mind around how that fits into proficiency with world languages. I’m definitely adapting this into my classroom this year. Thank you for sharing! I have a few questions about assessing for proficiency. Do you ever give summative proficiency assessments, like an end of quarter test? If not, how do you keep up with each kid and their proficiency level without giving formal assessments? Maybe you’re memory is just better than mine. But with ~200 students to remember, I don’t really have the memory for students’ individual levels until more toward the end of the school year when I’ve had more opportunities to gauge each students’ level. Do you have any examples of assessments you would use to determine their proficiency? For me a quick write or a retell are not proficiency. They are great formative checks, but these are memorized and predictable stories for them. To really know how well they have acquired the language, I want to put these structures in a new setting. What about giving them an embedded reading of a story they have never seen that incorporates the structures they should know? They are seeing them in a new context. Maybe we could give them a picture they have never seen or described in class and have them tell us a story about it to grade their proficiency. Your thoughts? – Proficiency Assessments should be unannounced. If announced, kids will spend unnecessary effort on a scale from “no big deal” to “freak out” trying to prepare (but you can’t prepare for proficiency, else, you assess learned performance and not spontaneous proficiency). The safety net is Reassessment. – I use any and every piece of evidence available to determine a proficiency grade. If I hear something from a student, I make a note of it (I don’t have THAT good a memory to never keep track of these). If I see written work that shows they meet a proficiency level, I use that as my evidence. I am on their side; not every kid will have a good day on the “test day” I’ve determined, so I cast a wide net. If you give unit tests straight from a textbook, use them, just look for items that point you towards proficiency and not knowledge. I agree and think that comprehension questions concerning a parallel story (with the structures they should know, but some details changed) should certainly be used to assess proficiency. – I don’t consider daily reported grades as “informal.” The Summative Assessment is just the last piece of evidence you use before the quarter ends. If you can manually change a course grade for the year, use a single Summative Assessment in June that should reflect current higher proficiency (replacing any previously averaged lower grades). – You feel that “a quick write or Retell are not proficiency,” but ACTFL doesn’t. On page 9 of the Proficiency Guidelines, you’ll find that memorized phrases are a hallmark of Novice until they begin to combine these phrases in the Intermediate level. Most of your students will be in the Novice level, even as far as the 3rd or 4th year for some. Add “then write a new ending,” or “rewrite the ending” to your quick write and/or retell prompts and you’ll get proficiency. – I have used Rory’s Story Cubes as well as pictures for 5min writing prompts. I always give them the option of writing anything else they want if those prompts don’t speak to them (= compelling). Don’t allow this grading system to feel like its “off the rails.” Focus on how global it can be, and use assessments you know well. Hello. Thank you for this very informative post and for sharing your grading system with us. I am currently trying to make the shift to standards based and I am trying to rethink my grading system. I do have an issue, however, that I thought you may be able to help me with. I teach 5th-8th grade Spanish (5th 2 Xs a week for 45 min and 6-8 3Xs a week from 45min) and so I am unsure as to which proficiency level each grade should be shooting for. I have been told that I MIGHT be able to get my 8th graders to Novice high by the end of 8th grade, so that leaves me scratching my head about 5-7th. Also, my school has another teacher who teaches Spanish from pre-kindergarten to 4th grade, so Novice-Low should be WAY out of the question for even those in 5th grade. Should 5-7 be working on Novice-Mid? If so, how do I differentiate using your rubrics? This is a question I have asked a few times and have not been able to get a substantial answer to. Any help would be greatly appreciated. I see no reason that each year must have a different rubric! Proficiency levels/goals aren’t linear per year, so Novice Mid through 8th seems fine. 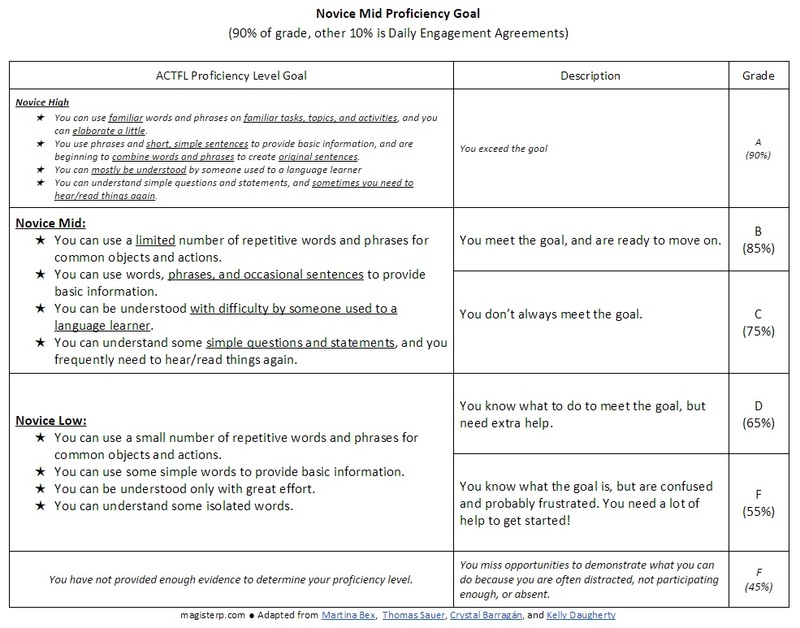 If the goal is Novice High, however, and a student is moving more slowly, use the Novice Mid rubric for them. What exactly do you mean by “differentiation” in using the rubrics? You can differentiate by “assessment” type because ANYTHING can be added to the portfolio that counts as evidence of understanding, which could be quite different from student to student. Pingback: Proficiency Grading: The last rubrics you’ll ever need | Magister P.
3 questions: how do students get a 100? In your system, a 95 is top score. Also, every time we introduce new condos l concepts, proficiency decreases. How can I judge they are truly a novice mid, etc? Finally, if my semesters are set in stone, how should I proceed, by making semester 1 target novice mid for an 80, and second semester you must hit novice high? 1. No, my top score is an A+ (100) for exceeding the goal. The lowest goal, Novice Mid, is a very realistic goal, which is an A (95). Go ahead and change the grades if you need “meeting the goal” to be a 100 in certain grade hyper-aware communities. 2. “Condos 1 concepts” is an autocorrected typo I can’t figure out, but will do my best. Proficiency reflects what students can understand and do at any given moment regardless of instruction. Proficiency does NOT decrease. Performance usually does, but not Proficiency. If it does, that’s a sign of moving too fast and perhaps testing isolated units of language study (knowledge?) with very little recycling of communicative language. If you assign a Proficiency grade based on an assessment of the most recent “concepts,” students will obviously not do as well. Don’t do that. That’s what the portfolio (physical and digital) is for. As long as students continue to understand MOST of what’s going on throughout the year, they should be meeting the goal. 3. The Proficiency goals and rubrics are NOT linear based on any sort of timeline. You might have a 4th year student still at Novice Mid. Don’t grade her against an Intermediate High rubric…there’s no way she will feel successful. I teach at a very small school where students of all different levels are lumped into class by grade. (One 9th grade class, one 10th grade class, etc. through 12th grade.) It’s challenging. In my 10th grade class I have a native speaker, student who just returned from 9 years living in South America, a lot of “regular” kids who have been at the school in more or less the same track since middle school, and a couple sophomores completely brand new to Spanish. How can I possibly set the same Proficiency goal for them while not having the lower ones feel unsuccessful and keeping the higher level students challenged and improving? I know you will say “you don’t,” but..help! Should I literally give every student a sort of “intake” assessment, then give them all individual Proficiency rubrics for the year? Quarter? I suppose if I did that other than ensuring I am providing compelling input, I’ll need to make clear that THEY know what THEY are reasonably expected to reach by years’ end, but ACK it is making my head hurt. Yep, easy. Use the appropriate rubric for each student which would get them an A. No one says you must hold students of different levels to the same criteria, even if the course is the same name. I am trying to revamp my system this year to be more proficiency based, but my department’s curriculum is so grammar heavy that I’m having trouble getting started. I understand about setting up the standards and a target goal for my Spanish 2 course, however, could you explain the proficiency portfolios and how you pick and choose work to grade on the proficiency scale? Do you assign things traditionally (homework, classwork, projects, etc.) and look for what displays a growth in proficiency for each student? How do you present all of this to students at the beginning of the year? I don’t grade any of that stuff; it has little to no effect on Proficiency. Instead, it’s scored, or just marked as completed in the 0% Digital Portfolio grading category. The Proficiency Rubrics are self-assessed by students and checked by you only once per grading term. The rubric is the course grade, not criteria by which to grade individual assignments (although you can use that if forced in certain situations). I’m very transparent about expectations, which you can see in the CI Materials tab above.